All items listed here new (unless otherwise stated) and are from stock held in New Zealand and sold by Hugh Bomford. The proceeds of sales do not go to the Rhodesian Services Association Incorporated. However, Hugh Bomford substantially subsidises the operation of the Rhodesian Services Association's website as well as contributing on an annual basis to the fundraising auctions and raffles. All prices below are in NZ$, most do not include postage. To order - email hughbomford@xtra.co.nz with your requirements. We will get it weighed and priced and get back to you with a total. Other payment methods we do not accept credit cards, postal orders or Western Union transfers. We prefer payment by PayPal, bank cheque or transfer. Msasa Enterprises are producers of fine quality historic audio-visual material from the Southern African region. Included in their archive is an extensive and growing collection of Rhodesiana films and sound recordings as well as the addition of new material from the Zulu Battlefields period. Msasa Enterprises has maintained the high standard and quality of its imagery since commencing production in 1997. Their archive material is stored on broadcast quality digital video tape and is sourced from original 16/35mm films that were graded and transferred via professional telecine. The DVDs are in PAL format and are zoned for worldwide distribution. Some titles are on NTSC and we can order on request. Msasa Enterprises guarantee the original source and quality of the products. Please beware of 'low-grade imitations' that may be available from elsewhere. A two disk digitally re-mastered package of original historic film 'gems' from the tumultuous period of Rhodesia in the 70s. This special edition DVD takes you from the establishment of early government in 1924, through the building of Kariba Dam in the early 60s, to an experience with the 'fuzz' and the women of the RWS, finally closing with a beautiful documentary on the diversity of nature with which Rhodesia was blessed. Along the way you will see many of the faces that helped to build the nation of Rhodesia. "What a time it was - with so few friends to turn to..."
A powerful documentary of human courage and survival during events following the missile attack and shooting down of commercial passenger aircraft in Rhodesia in late 1978 and early 1979 as related by survivors and security forces. In modern jargon - this was Rhodesia's 9/11 but unlike the event in America there was no world condemnation - just a world wide deafening silence. At any given time there were at least half a dozen conflicts taking place in Africa, from civil strife and brutal insurgencies to full-blown conventional wars. Yet apart from the grand campaigns and battles of colonial yesteryear - Omdurman, Isandlwana, Spoinkop et al - little is known outside the Dark Continent of the plethora of bushfire wars that occur with monotonous regularity. 30° South Publishers have combined resources with Helion & Company to produce a series of groundbreaking studies of Africa's post-1945 conflicts under the title of Africa @ War. Each volume is 64 pages, richly illustrated with black and white and colour photographs as well as diagrams and maps, A4 size, softcover. France in Centrafrique explores the early colonial and post-colonial history of French Equatorial Africa with a particular emphasis on the role of the Central African Republic in the Second World War and the Free French Movement. One of the key figures to emerge from this period, and a man who would shape the modern destiny of the Central African Republic, was Jean-Bédel Bokassa. Bokassa served alongside the Free French under General Charles de Gaulle and later in the metropolitan French military as an NCO in Indo-China. The narrative traces his ascent from these humble beginnings to his position as one of the region’s most notorious dictators, exploring both his excesses of violence and personal aggrandizement and the role played by France and the wide-reaching Foccart intelligence network in his rise and fall. Baxter examines the past and present relationship of France with her erstwhile African colonial possessions, giving substance to the cause and effect of the many French interventions and the play of various individual personalities, both French and African, and how this has affected the current complexion of the region and its ongoing relationship with France. The book traces the overt and covert French military actions in the region, the rise of internal violence and insecurity and the increasing involvement of the international community in the series of coups and counter-coups that characterized the 1990s and the new century. Featured are Operation Barracuda, Operations Almandin I, II and II, Operation Boali and the various regional, international and European regional interventions. Battle for Cassinga is the first-hand account by a South African paratrooper who was involved in the 1978 assault on the Angolan headquarters of PLAN, SWAPO’s armed wing. The battle, although a resounding success, suffered setbacks which could have proved disastrous to the South Africans had they not maintained the initiative. The improvisations made by Colonel Jan Breytenbach ensured that a flawed jump and inadequate intelligence did not adversely affect the outcome. The unforeseen Soviet-supplied SWAPO antiaircraft guns used devastatingly in a ground role also threatened to derail the attack. A late appearance by a large Cuban/FAPLA (Angolan regulars) armoured column, from the nearby town of Techamutete, threatened to engulf the lightly armed paratrooper force still on the ground. A fierce rearguard action, together with the almost suicidal actions of the South African Air Force pilots, ultimately saved the day. McWilliams examines why the South African government took the political risk in attacking ‘Fortress Cassinga’ in a cross-border operation that would clearly attract the ire of the world. He studies SWAPO claims that Cassinga was a refugee camp guarded by only a few PLAN soldiers, explaining why Sam Nujoma, the SWAPO leader, had no option but to perpetuate this falsehood. He looks dispassionately at all the players involved: SWAPO/PLAN and their commander Dimo Amaambo who fled the field of battle; the Cuban and FAPLA intervention; and the South African paratroopers, led by Breytenbach, who not only had to combat a determined enemy but also senior South African staff officers. Above all, it is a soldier’s tale which pays homage in equal parts to the bravery of the paratroopers and the determination of the PLAN fighters who stood to their guns until annihilated. “Clearly and comprehensively explains the intrigues of the Congo wars” – Colonel Mike Hoare "Post-independence events in the Republic of the Congo are a veritable Gordian knot." The Second World War forever altered the complexion of the British Empire. From Cyprus to Malaya, from Borneo to Suez, the dominoes began to fall within a decade of peace in Europe. Africa in the late 1940s and 1950s was energized by the grant of independence to India, and the emergence of a credible indigenous intellectual and political caste that was poised to inherit control from the waning European imperial powers. The British on the whole managed to disengage from Africa with a minimum of ill feeling and violence, conceding power in the Gold Coast, Nigeria and Sierra Leone under an orderly constitutional process, and engaging only in the suppression of civil disturbances in Nyasaland and Northern Rhodesia as the practicalities of a political handover were negotiated. In Kenya, however, matters were different. A vociferous local settler lobby had accrued significant economic and political authority under a local legislature, coupled with the fact that much familial pressure could be brought to bear in Whitehall by British settlers of wealth and influence, most of whom were utterly irreconciled to the notion of any kind of political handover. Mau Mau was less than a liberation movement, but much more than a mere civil disturbance. Its historic importance is based primarily on the fact that the Mau Mau campaign was one of the first violent confrontations in sub-Saharan Africa to take place over the question of the self-determination of the masses. It also epitomized the quandary suffered by the white settler communities of Africa who had been promised utopia in an earlier century, only to be confronted in a post-war world by the completely unexpected reality of black political aspiration. This book journeys through the birth of British East Africa as a settled territory of the Empire, and the inevitable politics of confrontation that emerged from the unequal distribution of resources and power. It covers the emergence and growth of Mau Mau, and the strategies applied by the British to confront and nullify what was in reality a tactically inexpert, but nonetheless powerfully symbolic black expression of political violence. That Mau Mau set the tone for Kenyan independence somewhat blurred the clean line of victory and defeat. The revolt was suppressed and peace restored, but events in the colony were nevertheless swept along by the greater movement of Africa toward independences, resulting in the eventual establishment of majority rule in Kenya in 1964. South African Mirages and Cuban MiG-21s dogfighting over Cuito Cuanavale, the largest tank battle on African soil since El Alamein; Puma troopships shot out of the skies by Strela missiles and RPG-7 rockets; Alouette III gunships hovering menacingly above Koevoet tracker-combat teams as they close in for the kill; Hercules and Transall transports disgorging their loads of Parabats over Cassinga; suicidal helicopter hot- extractions of Recce operators deep in enemy territory; and a lone Alouette pilot who disobeyed orders and under intense ground fire evacuated a critically wounded soldier … such is the story of the South African Air Force, the SAAF, over the 23-year period 1966–1989, the period of conflict that became known as the ‘Border War’. Set against the backdrop of the Cold War, the SAAF was effectively South Africa’s first line of defence against Soviet expansionism in southern Africa. That the Soviets, through their surrogates—the Cuban military, Angola’s FAPLA and Namibia’s SWAPO—sought a communist regime in South Africa is indisputable, as too was the SAAF’s skill, quality, determination and capability to defeat the best Soviet air defences of the time. This account covers all the major operations that the SAAF was involved in, from Operation Blouwildebees, the opening salvo of the conflict at Omgulumbashe, South West Africa in 1966 to the final curtain, Operation Merlyn, the so-called April Fool’s Day ‘war’ of 1989 when the SAAF and Koevoet, almost alone, frustrated SWAPO’s last throw of the dice with its illegal invasion of South West Africa. In this account, making reference to all the principal operations of the war, Baxter examines and brings to life the squadrons and aviators that fought in both counter-insurgency and conventional warfare roles. Besides an extensive selection of rare photographs, the book features a comprehensive section on camouflage and markings and 6 pages of colour aircraft profiles and insignia by noted SAAF authority William Marshall, making this title especially useful for modellers. This book tells the story of the international intervention that took place in Somalia, the successes, failures and lessons learned. Many broad assumptions were made based on an unclear understanding of the dynamics of a regional conflict, coupled with the necessity for the first time in modern military history to balance political necessities with military. The crisis in Somalia set the tone for military intervention in a post- Cold War world, and although the same mistakes have been depressingly often repeated, the complexion of global military organization changed dramatically as a consequence of this episode. In 1961, Portugal found itself fighting a war to retain its colonial possessions and preserve the remnants of its empire. It was almost completely unprepared to do so, and this was particularly evident in its ability to project power and to control the vast colonial spaces in Africa. Following the uprisings of March of 1961 in the north of Angola, Portugal poured troops into the colony as fast as its creaking logistic system would allow; however, these new arrivals were not competent and did not possess the skills needed to fight a counterinsurgency. While counterinsurgency by its nature requires substantial numbers of light infantry, the force must be trained in the craft of fighting a ‘small war’ to be effective. The majority of the arriving troops had no such indoctrination and had been readied at an accelerated pace. Even their uniforms were hastily crafted and not ideally suited to fighting in the bush. In reoccupying the north and addressing the enemy threat, Portugal quickly realized that its most effective forces were those with special qualifications and advanced training. Unfortunately, there were only very small numbers of such elite forces. The maturing experiences of Portuguese and their consequent adjustments to fight a counterinsurgency led to development of specialized, tailored units to close the gaps in skills and knowledge between the insurgents and their forces. The most remarkable such force was the flechas, indigenous Bushmen who lived in eastern Angola with the capacity to live and fight in its difficult terrain aptly named ‘Lands at the End of the Earth’. Founded in 1966, they were active until the end of the war in 1974, and were so successful in their methods that the flecha template was copied in the other theaters of Guiné and Mozambique and later in the South African Border War. The flechas were a force unique to the conflicts of southern Africa. A flecha could smell the enemy and his weapons and read the bush in ways that no others could do. He would sleep with one ear to the ground and the other to the atmosphere and would be awakened by an enemy walking a mile away. He could conceal himself in a minimum of cover and find food and water in impossible places. In short, he was vastly superior to the enemy in the environment of eastern Angola, and at the height of the campaign there (1966–1974) this small force accounted for 60 per cent of all enemy kills. This book is the story of how they came to be formed and organized, their initial teething difficulties, and their unqualified successes. Great Lakes Holocaust is the first in two volumes covering military operations in Zaire – as the Congo was named from 1971 until 1997 – and the Democratic Republic of Congo at the turn of the 21st century. This volume explores the events of the 1980s and 1990s in Rwanda and Uganda, which eventually spilled over the borders into Zaire, resulting in one of the worst tragedies ever to befall an African region. The narrative traces the ascent of crucial Rwandan, Congolese and Ugandan military and political figures, and their connections within influential business and political circles in and outside Africa. It examines the build-up of the Zairian military under the government of dictator Mobutu Sese Seko in the 1960s and 1970s, and provides an in-depth study into reasons for its near-collapse in the early 1990s. The military build-up of Rwanda and Uganda is discussed in detail as is their planning for operations inside Zaire, and the global logistic tail that provided the Rwandan military, particularly, but also most of its opponents, with a capability of not only waging war beyond their borders, but – in the case of Rwanda – of invading and practically conquering a country the size of Western Europe or the USA east of the Mississippi. The book further traces the covert Rwandan military actions inside Zaire, initially run under the guise of an insurgency by one of Zaire’s ethnic minorities; how ever-deepening Rwandan operations inside Zaire were practically dictated by concentrations of Hutu refugees; and how the insurgency – led by Laurent-Désiré Kabila who was installed by key Rwandan and Ugandan military and political figures – developed into an organization that sought autonomy from the military and political dictates of Rwanda, in turn delivering a direct reason for the Second Congo War which was fought from 1998–2003. The story of the 7 months hardship of a white woman farmer and her family living under the constant scrutiny and intimidation of so called war veterans. She records that she and her family supported the introduction of black rule in Rhodesia during the war years. She now chronicles the effects that Mugabe's rule has had on Zimbabwe's rural community both black and white. It tells of the destruction of the country's economy, the collapse of tourism and ruination of agriculture. Love, politics and tragedy in Africa… Tells of the life of John Hammond, one of Rhodesia's earliest and foremost educators. He was a controversial but much loved figure and his daughter, Jill Baker, tells the touching story of his struggle to achieve his goals. Entwined through the story is the deep love between him and his wife Nancy. A true story of survival in the tradition of Tenko. The author was taken prisoner at the fall of Singapore and spent the rest of the war as a slave labourer in a mine adjacent to the Japanese POW camp at Kinkaseki in Formosa (now Taiwan). It is a chilling story of brutality and cruelty written 50 or so years after the event and about his journey to revisit the site of his imprisonment and the ghosts he tried to lay to rest. 'Mzee' is the Swahili word for an 'old timer', a respected elder. Mzee Ali Kalikilima was born near the present-day town of Tabora in western Tanzania, probably in the 1870s (there is mention of 'The Doctor'-Dr David Livingstone) to black Muslim parents of noble birth. This remarkable book was inspired by the campfire memoirs of Mzee Ali Kalikilima, the Tabora-born son of an arabized Nyamwezi slave trader. The first part tells of his safaris to the east of Lake Tanganyika, and of taking his slaves and ivory on to Dar es Salaam. The second tells of his adventures as a German askari with the Dar to Kigoma railway survey and construction projects. And the third tells of his experiences with von Lettow's siege of the Mombasa-Nairobi railway, his desperate retreat into Portuguese territory and his postarmistice surrender south of Kasama, Northern Rhodesia. This book captures what one imagines life was like in German East Africa between the 1880s and 1918, but it is not a strict biography. Bror MacDonnell's (1921-98) notes on Mzee Ali were made in Tanganyika in the late forties, when he and this "old grey-haired gentleman" worked for the locust control department. He wrote out the original manuscript in Salisbury in the early sixties and dictated it to a typist a decade later. It was then rewritten in 2005 by a Johannesburg editor determined "to get inside the mind of Mzee Ali." MacDonnell's former typist recalls his text as being overly factual and colourless; this book is nothing of the sort. Certain portions of the book - its vivid accounts of raging bush fires, voracious tsetse flies and of Dar's sights and smell - need not have originated with Mzee Ali. On the other hand, its eye-opening details of the slave trading business and the ordeal of von Lettow's retreat probably do. But who thought to liken Africans' emotional responses to their German overlords to those of the earlier slave traders? The comparison is apt, but such psychologizing is not typical of slave traders' memoirs. Did MacDonnell actually elicit these insights from Mzee Ali? Or did someone attribute them to him? This is a fascinating tale. Readers will find it hard to put down and will enjoy trying to puzzle out each bits author. Valya Chervenyashka was a Bulgarian nurse who imprisoned in Libya in 1998 for eight years accused of conspiring to deliberately infect 400 children with HIV. Her story, covering a decade of torture, cruelty and absolute despair is an inspiration in survival. “Gold mined at Tati was identified with the dynasty of the Queen of Sheba and the ancient rulers of biblical Ophir. David’s book records how this notion, mentioned in Milton’s Paradise Lost, was discarded as being romantic fiction. But romance there is here a-plenty.” —John Gordon Davis, best-selling author of Hold My Hand I’m Dying. The gold at Tati, which was discovered by the geologist Carl Mauch, was actually on the site of pre-historic diggings that had been mined there 400 years previously by the Makalanga people. Tati lay on the missionary road to the north, used by Livingstone and Moffat, and it was part of Cecil Rhodes’s dream of a continuous tract of British imperialism from Cape to Cairo. The annexation of Bechuanaland was a direct result of the conflicts between the tribes within the area and the threats from President Kruger and from Germany which had recently colonised Angra Pequena. Gold from the early diggings here found its way to Great Zimbabwe and the famous golden rhinoceros from Mapungubwe was probably fashioned from gold mined at Tati. This forgotten corner of the sub-continent encapsulates a chapter of our history involving five countries, powerful men, much subterfuge, a botched invasion, a rebellion, land annexation, prospectors, hunters, traders and adventurers. It is a story begging to be told. This is a rollicking biography of Dr Leander Starr Jameson - hero, rogue and rascal of Empire and the man who inspired Kipling to write his masterpiece, 'If'. The famous poem by Rudyard Kipling is based on the life of Jameson, and the suffering he endured as a result of the doomed raid that he and his Rhodesian and Bechuanaland policemen carried out against Paul Kruger's Transvaal Republic in 1896. In this engaging biography - in the style of Wilbur Smith meets Louis l'Amour - Ash recounts the life of this colonial statesman known as 'Dr Jim' or simply 'The Doctor'. He was an enigmatic man: when he died The Times estimated that his astonishing personal sway over his followers was equalled only by that of Parnell, the Irish patriot. During the fervour of the South African diamond rush Jameson established a small medical practice in Kimberley in 1878; it was here that he met and forged a lifelong friendship with Cecil John Rhodes. Jameson's thirst for adventure, coupled with Rhodes's dream of expanding the British Empire from the Cape to Cairo, led - under Royal Charter to the British South Africa Company - to the occupation of Mashonaland in 1890, with Jameson having laid the groundwork in his political dealings with Lobengula, King of the Matabele. And so began Jameson's rollercoaster adventure: from Administrator of Mashonaland, to the 'invasion' of Portuguese East Africa (Mozambique), the Matabele War and the infamous 'Jameson Raid' and his subsequent trial and incarceration in London. Despite the raid, Jameson had a successful political life. He died on 26 November 1917 in London. His body was laid in a vault at Kensal Green cemetery where it remained until the end of the First World War. Ian Colvin wrote in 1923 that Jameson's body was then "... carried to Rhodesia and on 22 May 1920, laid in a grave cut in the granite on the top of the mountain which Rhodes had called 'The View of the World' (in the Matopos Hills near Bulawayo), close beside the grave of his friend." Kevin worked as a double agent for the South African apartheid government and Robert Mugabe’s Central Intelligence Organization in the 80s. He was incarcerated in the notorious Chikurubi Maximum Security Prison (Harare) for nearly 20 years, five of which were spent naked on death row. His release was pleaded to Mugabe by none other than Nelson Mandela in the 90s but this fell on deaf ears. Finally, in 2006 he received a presidential pardon. Kevin now lives in South Africa and has launched a well-received career in motivational speaking. This is his story. This compelling autobiography takes a privileged young white man from studying philosophy at Wits University to joining the banned ANC movement. Exiled from South Africa he and his wife live in ANC camps in Zambia, Tanzania and Zimbabwe. The insight into his experiences is both forthright and humorous as he explores the many "exiles" he faces. “... enjoyable, convincing story wrapped in dramatic, well-researched history” — John Gordon Davis, bestselling author of Hold My Hand I’m Dying. It is 1834. The Eastern Cape frontier is burning. Rauch Beukes, a young Boer of 17, returns to the family homestead to find it razed, the livestock gone and his mother and sisters slaughtered by the marauding Xhosa from across the Great Fish River. So begins a tale of violence and warfare and love and lust across racial divides, painted against the grand backdrop of the Boer migration north into the hinterland that became known as the Great Trek, the result of British duplicity and injustice. The dramatis personae are Boer and Brit, Xhosa, Zulu, Matabele and Cape Malay slaves: from the Xhosa chief Hinsta, Colonel Harry Smith, the Zulu tyrant Dingaan, to the Boer trekkers Potgieter, Retief, Maritz, Trichardt and Cilliers. And in young Rauch’s life are three astonishing women: Ameila, the daughter of an English settler; Marietjie, the beautiful meisie from Graaff-Reinet; and Katrina September, the sensual ex-slave. Fall of the Leaf is a sensitive and faithful representation of the lives of three white English-speaking men, from the war years to the present time. The epoch broadly covers sixty years of South African history; it encompasses the pre-apartheid years of English cultural dominance, the apartheid period under Afrikaner Nationalist rule and the succeeding years of democracy under the ANC government. The fulcrum and meeting point of the novel is a fifty-year school reunion. Set against the backdrops of the genocidal massacre of the Matabele by Mugabe's North Korean trained 5th Brigade in the 1980's and the recent actions of Mugabe in the year 2000, the author, himself a veteran of the Bush War, takes you on a journey with characters based on real people and real events. Exciting and believable. The author has written this story directly from his own experience as a soldier who has served with the former US Army Special Forces (Green Berets) and the Rhodesian Light Infantry Battalion. He also earned a degree in medicine at the University of Rhodesia (now Zimbabwe). The book tell the story of Kurt Christianson who is a natural military strategist and survivor. Independent, unorthodox, resilient and resolute, he displays skills which flout established procedures. His courage and insight whilst in Special Forces in Nam unwittingly unravel a traitorous alliance, making him a threat to his superiors and placing his life in mortal danger. This threat, combined with his inability to adjust to civilian life, spurs him to leave his beloved and beautiful Maine coastline and embark on a path of revelation and serendipity. He crews a boat being delivered to the oil fields in West Africa, where he becomes embroiled in covert action and again demonstrates his innate and inspired tactical abilities. A hunted man, his journey leads him to bitter combat in a brutal landscape, tragic loss and to fulfil a San prophecy whilst wrestling with his alter ego - Mad Medic - and his Viking ancestry. The merciless and barbaric slaughter of a little girl and her family by terrorists move him to astonishing, crucial and shocking acts which change the course of a ravaged and savaged country. Kurt is also driven to revenge, a deed which violates his code of ethics and irreversibly affects his destiny. Ultimately, Kurt faces the inescapable and irrefutable knowledge that heroes are human and therefore fallible and that glory, however hard-won and merited, is illusory and hollow. Shadow Tracker, an adrenaline-charged adventure, engages the reader in events which remain unknown to most of the world and leave one breathless. A fast-moving, very readable action-packed account of Granger Korff's two years of service during 1980/81 with 1 Parachute Battalion at the height of the South African war in South West Africa (Namibia) and Angola. Apart from the 'standard' counter-insurgency activities of Fireforce operations, ambushing and patrols, to contact and destroy SWAPO guerrillas, he was involved in several massive South African Defence Force (SADF) conventional cross-border operations, such as Protea, Daisy and Carnation, into Angola to take on FAPLA (Angolan MPLA troops) and their Cuban and Soviet allies. Having grown up as an East Rand rebel street-fighter, Korff's military 'career' is marred with controversy. He is always in trouble-going AWOL on the eve of battle in order to get to the front; facing a court martial for beating up, and reducing to tears, a sergeant-major in front of the troops; fist-fighting with Drug Squad agents; arrested at gunpoint after the gruelling seven-week, 700km Recce selection endurance march are but some of the colourful anecdotes that lace this account of service in the SADF. Granger Korff was born in 1960 grew up in the mining town of Benoni. In 1985 he travelled to the USA on a four-month boxing/vacation walkabout where he haunted the mean streets of Los Angeles, scrapping and boxing to survive. Ike Turner and Mickey Rourke were his drinking buddies and he almost became Jake LaMotta's ('The Raging Bull') son-in-law. Twenty-four years later, Granger still lives in LA, where he runs a small plumbing business. Specs: Hardback, 544 pages, 234mm x 153mm 120 b/w photos, maps. Using archival sources and private documents recently unearthed, Come Back to Portofino chronicles the journey taken by the volunteers in the 6th South African Armoured Division. From training camps in Egypt through to the idyllic summer of 1945 the ‘Div’ left its mark on towns and villages across Italy. From Monte Cassino to the outskirts of Venice and Milan, the campaign lasted exactly twelve months. During the advance through Rome up to Florence, it was a case of constant movement and violent contact with the enemy. Experiences which left an enduring impression on returned soldiers included the periods of rest at Siena and Lucca as well as the four miserable winter months in the northern Apennines. Overall, the casualty rate was surprisingly low considering the ideal ambush country and mountain defences which had to be overcome. In the rifle companies however, the rate of attrition was high and replacements were few. Among the South Africans who are buried in Italy, there are those who died in vehicle accidents, from drowning and falling out of windows or from suicide. For the ordinary soldier the most important part of everyday life was contact with home or foraging for food and wine, and even enjoying the company of signorine when operations permitted. Nevertheless, it was not one long happy camping trip as was often portrayed in the press. The cast is made up of the famous regiments and ordinary South Africans who participated in these epic events. This book has a significant Rhodesian connection as many Rhodesians served with the 6th South African Armoured Division. A coffee table hard cover book of 197 pages of full size and mostly colour illustrations. In a war where cameras were forbidden amongst the soldiers, few personal records were made. However some of these pictures will bring back memories, stark and real. Chas, a soldier himself, has cemented these illustrations with his own style of poetry - raw and poignant. A "must buy" for any family that had connections with Rhodesia. Preserve history and let your children be able to say with pride - "my dad was there". Unapologetic, unassuming and forthright, the combat exploits of Executive Outcomes (EO) in Angola and Sierra Leone are recounted for the first time by a battlefield commander who was physically on the ground during all their major combat operations. From fighting UNITA for the critical oil installations and diamond fields of Angola to the offensive against the RUF in Sierra Leone to capture the Kono diamond fields and the palace coup which ousted Captain Valentine Strasser, van Heerden was at the forefront. He tells of the tragedy of child soldiers, illegal diamond mining and the curse of government soldiers who turn on their own people; he tells of RUF atrocities, the harrowing attempt to rescue a downed EO pilot and the poignant efforts to recover the remains of EO soldiers killed in action. Coupled with van Heerden’s gripping exposé, hitherto unpublished photographs, order of battle charts and battle maps offer unprecedented access to the major actions as they took place on the ground during the heydays of EO. A stylish, first-hand account of Britain’s futile struggle to retain its stake in East Africa in the face of the relentless Mau Mau uprising. It is a book that is filled with revelations, many damning. Due to the recent unrest in Kenya, Peter Hewitt has brought the book full circle with an updated afterword on the current violent and political crisis. 1919, the regiment was re-formed in 1940 during World War II as The Rhodesian African Rifles, seeing action in Egypt and Burma. In the 1950s, the regiment distinguished itself further during the Malayan Emergency. During the 1960s and 1970s, the regiment was at the forefront of hostilities in the bloody Rhodesian ‘bush war’. In the specialist Fireforce role, heli- and para-borne, the soldiers of the RAR were to earn themselves a fearsome reputation as counter-insurgency fighters par excellence. Ironically, it was after Zimbabwean independence in 1980, that the RAR’s finest hour came, when, fighting for their erstwhile enemy, Robert Mugabe, the soldiers of the RAR defeated Joshua Nkomo’s invading ZIPRA armies at the battles of Entumbane in Bulawayo. The sadness and tragedy of it all was how the warriors of the RAR faded, almost unnoticed, into history … Ndichakutengera sweet banana. Spitfire PK350 is the only late-mark Spitfire, an F Mk 22, to have ever been restored to full flying status. She had no restrictions on her airframe and with four fully serviceable 20mm cannons, she was as good as the day she came off the production line in July 1945 at the massive Castle Bromwich factory near Birmingham in England. She first flew as a restored aircraft on 29 March 1980 at the hands of one John McVicar ‘Jack’ Malloch. By then a legend in his adopted country Rhodesia, Malloch had, in 1977, been entrusted by the hierarchy of the Rhodesian Air Force to restore SR64, as she was then known. In two and half years, Jack Malloch and his trusted engineers, with critical help from the Rhodesian and South African air forces, completely restored SR64 to flying condition. The fact that she was fitted with a propeller made by a German company added a sweet irony to a project that had to contend with sanctions imposed by Britain, the original country of manufacture, and highlighted the enterprising spirit of the team. This was possible because Malloch, with the backing of the Rhodesian government, had built up a successful charter airfreight company that assumed different guises, depending on where it was operating, to bypass sanctions. Malloch’s extensive network thus facilitated his ability to manage such a demanding a project in his quest to fulfil a dream: to restore and once again fly a Spitfire which he had flown in the RAF during the Second World War. Some fascinating insights are revealed in this account. From the test pilot who first flew her as PK350 on 25 July 1945 to the true ownership and vision for SR64 as a restored aircraft, the reader is taken on a journey through the aircraft’s complete life, with the project’s lead engineer and most of the surviving pilots who flew her gracing the story with their memories. For two years PK350 delighted those fortunate enough to see her fly, mostly round Salisbury (Harare) airport. Then, on what was planned to be its last flight, Malloch’s Spitfire never returned to base. Mercenaries have been a part of warfare for centuries, and though the names have changed, continue to play a part in global military conflicts. In today’s world these ‘soldiers for hire’ are an attractive alternative when Western governments are reluctant to put their militaries at risk for obscure causes that would otherwise be difficult to explain to their electorates. In this book, noted author and foreign correspondent Al J. Venter provides a fascinating look at modern mercenary actions in the Middle East and Africa. From brushfire wars in the Congo to outright genocides in Biafra, highly skilled mercenaries were called upon to fight for order, and also for a living. Whether facing fanatics in Somalia, staving off cannibals in Sierra Leone, or assisting a civil war in Angola, the mercs put their lives on the line for a cause. Many mercenaries freelanced, but under talented freebooting leaders some groups became crack outfits. South Africa’s Executive Outcomes became a legend in its own time like a quasi military itself, as it dispatched fighters throughout the continent. Like an ad hoc Foreign Legion, fighters came from around the globe to participate in combat. In the US, the publisher of Soldier of Fortune magazine organized repeated expeditions, from Laos to Peru. In Afghanistan the renowned helicopter gunship pilot ‘Nellis’ has recently lent his skills after almost singlehandedly defeating gruesome insurgencies in Africa. In this book Venter, who was actively involved in the direction and production of segments of the TV series Mercenaries, provides both background to this unique class of warriors, and a fascinating look at their methods and actions. The intention of this publication is to honour all who lost their lives in action, or while on active service, with the Rhodesian Security Forces during the period 1966–1981. This publication represents the single most comprehensive Rhodesian Combined Forces Roll of Honour covering the so-called Bush War. Many people have researched the casualties of the Rhodesian Bush War and it is highly unlikely that a single researcher will ever compile a definitive list of all those who perished. Dr J.R.T. 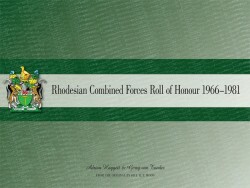 Wood produced the first ‘most comprehensive’ Roll of Honour of the Rhodesian Combined Forces while many others, including Gerry van Tonder and Adrian Haggett, have used his roll as a base for expansion, correction and addition. It is, therefore, thanks to Dr Wood’s original work that the Roll of Honour has been improved to this point. This book is not just a list of names and dates; it is eminently readable on account of the well-researched personal information on many of these Rhodesians who died serving their country. The way that this book has been compiled and produced is a credit to all concerned. In the air force no mission receives greater priority than the mission of mercy. When lives are at stake all resources available are dedicated to the task. Aircrew, ground crew, paramedics, doctors, mountaineers, navy divers, policemen and trained civilian volunteers are rapidly organized into a rescue team and dispatched with all haste to the disaster scene. This requires training, preparedness, dedication, determination and courage. Rescue missions are often flown in weather conditions that would normally ground all aircraft. Scenarios are as diverse as high-rise fires, mountain, flood and maritime rescues, to white-outs in the snows of Antarctica. Paperback, 320 pages, 198mm x 130mm with 30 cartoons and sketches. "…If that is what it feels like to be blown to smithereens, then it's not too bad. The noise of the explosion was horrendous and I lay on my back and gazed at my shredded shirt. When will the pain start? I thought, or will I die before that? I think I'd prefer to die than have the agony. I wiped my stomach and expected see copious quantities of blood. There was none, so I sat up. Van was already sitting. He too studied his body for mortal wounds and found none. We looked at each other and grinned. It was so silly. But where was Samil Venter? We stood and began dusting ourselves off as a groan caught my attention. Then we saw him: Sergeant-Major Venter was stalking around clutching his one hand. His thumb had been blown clean off, but so too had his trousers and underpants. His shirt was shredded and bits of material that used to be his combat pants hung from his webbing belt. Then there were his bare, long sinewy legs and finally his boots. The tops of his socks were also gone. He looked up at me, his face full of anguish, his teeth AWOL. His mouth was once again a maw: "Brookth, jou poeth! Kom hier!" I went to him immediately. "Yes, sergeant-major," I stammered. "Ith my jewels nog daar? Ith my fokken jewels nog daar?" I lifted my hand and felt, probably the way a doctor does when he asks you to cough. His genitalia were burnt black as were his inner thighs, also his leg hairs, but his precious jewels were there, intact. I smiled up at him. "Hulle is a betjie gebrand, sa'majoor, maar hulle is nog daar," "Okay, then, get out of my sight, jou poeth," he said quietly. I was hurt. We have this … this moment … and he tells me to get lost!" AJ Brooks matriculated, surprisingly, in 1978 and was called up in 1979 to 14th Field Regiment in Potchefstroom for his two years compulsory national service. He was transferred to the School of Artillery where he became an instructor as he felt he'd rather shout at people than be shouted at. It was here that his interest in guns and vintage artillery pieces was nurtured. He later served with 7th Medium Regiment for his first Citizen Force, or territorial, duties. In 1993 AJ was transferred to the Transvaal Horse Artillery where he was promoted to the rank of warrant officer and BSM of 9th Battery. Further tours of duty to the Army Battle School and Potchefstroom ensued before his resignation in 2003. AJ is married to Brenda and has two children. His first book, The Border, was published in 2007 and is being made into a major feature film. The South African Air Force (SAAF), formed on 1 February 1920, is the second oldest air force in the Commonwealth. The air arm played a major role in securing victory for the Allies during the Second World War, in the 1948/49 Berlin Airlift, and in Korea in the 1950s. The SAAF assisted Rhodesia in the 1960s and ’70s, made a major contribution to the ‘Border’ or ‘Bush’ war in South West Africa and Angola, participated in the transition to a new democracy in South Africa and continuously supports South African peace missions in Africa. It has also assisted in countless relief and rescue missions in southern Africa throughout this entire period. However, the SAAF is not just about aircraft and ordnance; it is made up of people and it is in this compilation that these people, airmen and ground crew alike, find their voice. These are their stories, all told in the first person by the actual participants as unvarnished, unabbreviated and intensely immediate and personal recollections. Through their stories of heroism, duty, adventure and tragedy, the reader will follow the history of the SAAF from 1939 to the present day. To complement the stories, the final chapter includes a collection of squadron pub songs from the Second World War, Korea and the Border War. The fascination of the Anglo-Zulu War of 1879 continues unabated. It was impassioned almost 40 years ago by the film Zulu, starring Stanley Baker and a yet-to-be-discovered Michael Caine. Zulu has been shown - and continues to be shown - on British television more than any other feature film. In the USA and elsewhere it has become a cult movie. Moreover, it created a near-avalanche of books, articles, lectures, documentaries and websites that has come close to being an industry. But the basis of all this activity was, in fact, generated 120 years ago by the weekly magazines of Victorian England such as the Illustrated London News. Although copies of the original magazines are much sought after and have become collectors' items, the compilers have painstakingly acquired every issue pertaining to the conflict and, having extracted every report and illustration on the subject, have produced, with an index, and in chronological order, a unique record of the Anglo-Zulu War, albeit through the eyes of a colonial Victorian age. Vlamgat, literally meaning 'flaming hole' in Afrikaans, was the nickname the South African Air Force (SAAF) gave to the Mirage F1, its formidable frontline jet fighter during South Africa's long Border Wars in South West Africa (Namibia) and Angola from the late 1960s to the late 1980s. Battling Soviet MiG-21s and -23s over African skies, the 'Vlammies' as the Mirage pilots were affectionately known, acquitted themselves with distinction and honour. Vlamgat - The story of the Mirage F1 in the South African Air Force is a gripping account of these pilots and their deeds of bravery; their experiences are authentically related with accuracy, humour and pathos by the author, himself a Vlammie. As Willem Hechter, former Chief of the SAAF, says: "Vlamgat deserves a place of pride in the long history of this, the second oldest air force in the world." The modern mercenary in combat - with the horror of 9/11 behind us, a new strategic equation tends to dominate world issues. These days, when the natives of some wayward African backwater become restless, or a South American warlord fosters insurrection, the big powers are inclined to look the other way. Thus the possibility of the Pentagon dispatching anything to assist a government in trouble - like the amphibious assault ship USS Saipan that went to Liberia with the 22nd Marine Expeditionary Unit in August 1990, or Britain sending HMS Ocean to Sierra Leone to quell insurrection - is unlikely. Similarly, the way things are Somalia won't get a sideways glance from any Western force. So another solution must be sought. Since it was the dogs of war that cleared the bramble patch in the old days, it will probably do so again. By proposing to license private military companies in early 2002, Britain now follows the American lead of companies like the Vinnell Corporation or Washington's MPRI in giving tacit support to what is regarded, by many military specialists, as the most logical option. While the concept of hiring freelance military professionals has some powerful detractors, the actions of these freebooters in recent years have shown that they are both efficient and cost effective. War Dog deals with mercenary activity in a score of wars: Angola, Sierra Leone, El Salvador, the DRC, Ethiopia, Lebanon and others. As one of a handful of correspondents who saw action with the South African 'guns for hire' group, Executive Outcomes, Al Venter reveals all about this organization as well as what has been going on in the Congo. While the major powers grapple with more serious international issues, dogs of war might very well be the answer for some of the brush-fire wars that continue to plague the developing world. Jeremy Hall’s childhood in the white-ruled apartheid South Africa of the 1950s and ’60s was ostensibly idyllic: growing up in the farming areas of Natal, he had free rein to pander to his keen exploratory mind, yet niggling away was entrenched racism and interracial hatred. Closeted in the hallowed halls of an English-speaking high school, the revelation of the real world that followed – a world of township unrest, Afrikaner politicians issuing dire warnings of the red and black hordes massing on the borders – exploded into Hall’s psyche with his national-service call-up into the South African Defence Force (SADF), where he encountered the institutionalized hatred of the Afrikaner hierarchy for the English-speaking recruits, the rowe, or ‘scabs’. Disillusioned and unsettled, following his SADF conscription, Hall found himself in 1976 signing on for three years with 2 Commando The Rhodesian Light Infantry as the bush war in that country erupted from a simmering, low-key insurgency into full-blown war. As a paratrooper with this crack airborne unit, he was to see continual combat on Fireforce operations and cross-border raids into Zambia and Mozambique, such as Operation Dingo, the 1977 Rhodesian attack on ZANLA’s Chimoio base. From colonial northern Zululand to guerrilla warfare in the Gona re Zhou of Rhodesia - this book covers a vast panorama of southern Africa. It is a sweeping canvas that evokes a bygone era of the 1940s' colonial Natal through to the cruel intensity of the 'Bush War' that ravaged Rhodesia in the 1970s. The book is in two distinct parts. Part 1 chronicles the author's earlier years of an idyllic childhood spent roaming and hunting among the empty, rolling hills of northern Zululand; of the inaccessible St Lucia waterway; the nostalgia of yellow fever trees; of building railway bridges into the wild interior; of colonial scallywags and native witchcraft; of sugar estates and poaching; of shipwrecks and the sweaty cantinas and backstreets of Lourenço Marques - a time that slipped away. Part 2 recounts the author's move north across the Limpopo where his love of adventure, hunting and the bushveld lead him to Rhodesia. He becomes a game ranger, dealing with 'problem animals' in the farming areas and the escalating terrorist war in the Gona re Zhou National Park in the beleaguered south-eastern Lowveld of the country. Trying to care for an environment and the animals that depend upon it, while the people around commit barbaric acts in the name of political ideology, brutally awakens the author to the reality of the disintegration of an organized colonial subcontinent. Ron Selley was born in 1947 and grew up in Zululand. He became fluent in Zulu, Afrikaans and French. In 1975, with his thirst for adventure and an overriding love of the bush, he moved to Rhodesia, where he joined the Department of National Parks & Wildlife as a game ranger, operating in the Lomagundi, the Zambezi Valley and the Gona re Zhou during the height of the Rhodesian Bush War. He returned to South Africa in 1979, hunted professionally for a period and joined KwaZulu Nature Conservation, in charge of the Kosi Lake system and Northern Beach areas. He now lives Lambert's Bay on the west coast of South Africa, running a variety of businesses-boat-charter, ship painting and cleaning services. He enjoys black-powder hunting, is an avid collector of World War II trucks and tanks, owns two Rolls Royces, which are in daily use, and is the station commander of National Sea Rescue Station 24A. The fascinating story of the 100 day siege of Ladysmith told from the diary of a British Army orderly, George Maidment. It is a story of great courage and great stupidity, of the very personal observations of a local boy caught up in one of the most famous sieges in British Military history. Over 27,000 Boer women and children died during the Anglo-Boer War. This is the account of those who died in the concentration camps of the Orange Free State in appalling conditions, of deprivation and starvation. It is the deeply moving but shockingly brutal story of a fierce, almost forgotten struggle for freedom. Darrell Hall tells of the Battle of Colenso, of the bloody battle that left scores of British dead on the field, of how it destroyed several military careers and left the British Army savouring the bitter taste of ignominious defeat. Yet, with defeat came heroic bravery and at Colenso 7 Victoria Crosses were awarded. It is also the story of General Louis Botha and his tenacious Boer commandos. This is an exciting account of the siege of Ladysmith and is written with the journalist's eye for history in the making. The author witnessed the battles, the hand to hand combat, experienced the actual bombardment an travelled with raiding parties. It was first published a century ago but is still eminently readable and intensely human. 544 pages 260mm x 215mm 200 colour & b/w photos Meticulously compiled, this book has been 18 years in the making. It is the complete international rugby encyclopaedia that presents every single recognized international ever played (since 1871 when Scotland took on England); is well illustrated and structured, featuring stories on the great players to have graced the game, the great matches to have captivated the crowds and the great stadiums to have hosted these internationals, as well as a plethora of rugby trivia. There is currently no such book on the market and there hasn't been since Chris Rhys published Guinness Rugby - The Records in 1987. Argentina, Australia, Canada, Cote d'Ivoire, England, Fiji, France, Georgia, Ireland, Italy, Japan, Namibia, New Zealand, Portugal, Rhodesia, Romania, Samoa, Scotland, South Africa, Spain, Tonga, USA, Uruguay, Zimbabwe, Wales. The heart and spirit of rugby described in Graham's book is still evident today, but the way the game was played-on a Saturday afternoon, on a dusty field, after a long day ploughing, is not. Somehow all this became overshadowed by the glamour of large clubs and competitions, fuelled by modern technology and communication. In this book Graham tells the stories, some dating back 100 years, of those recently arrived for work in a strange town on the platteland who, to be accepted by the community, had to play rugby. From labourers and mechanics to clerks and farmers, these are their stories and each one is unique. From the Northern Cape and Luderitz, down the west coast, into the Eastern Cape and through the Free State and Mpumalanga, Graham has recorded stories, as told to him, that will have you in stitches. Graham's style of writing is reminiscent of campfire (or perhaps braais and boerewors) storytelling, the humour lying in all the deviations and asides the story makes along the way. A series of five books (only 2 illustrated above) aimed at the 10 - 13 year old covering birds; fish; reptiles and frogs; large mammals and small mammals. These books follow principles of the South African Department of Education's Outcomes Based Education policy and are available in English or Afrikaans. They are designed to make learning fun and play a roll in enhancing creativity, motor co-ordination, the identification of colours, shapes and textures as well as increasing general knowledge. If you want your kids to have a wider knowledge than they would ordinarily gain and at the same time instil "a bit of Africa" in them then these quality activity books are for you. Contact us:- PO Box 13003, Tauranga 3141, New Zealand.